We need a Proper racing series! American's love their V8's. We have them in trucks, cars, racecars, and Corvettes, lots of Corvettes. Some have even found their way into less likely showcases, like motorcycles and blenders among other contraptions. But what we don't have is a truly awesome V8 race series. Now here is where I will get all the hate and death threats from the NASCAR fans. Please don't hurt me! But admit it, going around in a circle for 500 laps can get quite tedious for the fans watching. Yes, NASCAR does involve a lot of driver skill and yes, the cars are unbelievable and amazing, and the race yesterday had a great finish. However, you are still just going around a ring. Really, the only exciting thing that happens in NASCAR is the crashes and the ending. This I feel takes away from the real talent of the drivers, and the brilliance of these machines. These cars have monstrous V8's, something that sounds like thunder rolling through your ears at 200mph! The sound is glorious. However, the lack of turns and lack of proper racing does this engine and indeed these drivers a disservice. What we need in the states is this. 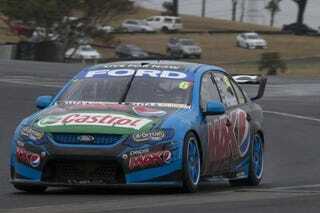 This my friends is Australian V8 Supercars. Now many of you might know about this series, about the drivers and even about the history of the sport and that's a good thing. For those that don't, this is what we need right now in American Motor Racing. With Formula 1 only coming to the States once a season and the whole mess of the Tudor United Sportscar Championship, there is a definite lack of proper racing here in America. Yes, we have Indy cars, but that is a whole other mess. What we need is our own version of the V8 Supercar Series. V8 Supercars essentially take production cars, throws them out, and then build spec chassis where manufactures and teams can change the outer character of the cars to showcase the manufacturer's production cars appearance. This enables the cost to be kept down within the series and ensures that safety is first and foremost. Teams can use any engine supplier they wish to power the cars. And power they do! Think about the rivalries that can happen if we bring out a version of these V8 Supercars to the States. Finally, we could have semi production engines that are found in our actual cars, but turned up to eleven. Ford could showcase it's brilliant Coyote engine and Chevy could put that monstrous LSA lump into the cars. Now for those that don't know much about the series or much about the land down under, essentially the country could be divided or at least it used to be divided into two categories, Ford or GM. Now the old adage about these races was that there was usually a massive fight between Ford and GM fans and then sometimes a race broke out. However, with Ford and GM pulling out of Australia, more manufacturers have been infiltrating the series. The most notable new comer was that of Volvo with the help of their in-house tuner Polestar, who gave us this beautifully designed engine. Now bringing this series to the states we could see the likes of GM, Ford, Toyota, Honda, Nissan, BMW, and maybe Mercedes who have also recently started in the V8 Supercar series. Bringing that level of engineering and the level of racing shown above could really make this series a true spectacle to watch. Throw in the added benefit that most of these Aussie races are held on street style courses and you have one hell of a series that can be dropped into any major city in the country! I can just imagine hearing those V8's roar through Lower Wacker Drive in Downtown Chicago! My god that might just bring on a few crisis's for Chicago race fans! Essentially, these cars are very similar to DTM or Touring Cars and other road racing cars, but in this series, all of the engines are the same basic configuration. This combination of massive engines, and both right and left turns make for some of the best racing possible to enjoy. Now here in the states, we had a small wetting of our appetites with V8 Supercars last year when the series came over to the Circuit of the Americas for one race. They aren't coming this year, but will be back here next year. Nevertheless, I feel one race a season can definitely be improved if we can come up with a similar racing series ourselves. The Australians have really done all the hard work already for us with designing, rules, and regulations already in place. If we can copy them, then we can get our own series started fairly easily here in the States. If we can also get a few of the NASCAR teams who already are adept with these engines and the style of building the cars, then the turnaround shouldn't be that long. I know it would still take a few years, but at least we would have some more racing in the US. Something that is desperately needed right now. This country needs properly good racing, and when your racing is this amazing and frantic, the success of this series is easily achieved. With the proper branding and showcase, we can definitely have another great V8 racing series. Moreover, with GM possibly bringing over the Holden tuners HSV, who coincidentally also run the Holden V8 Supercar team, then we could have a whole host of help just listening to them. Long live the Aussies and their lunacy. So what do you think everyone, should we also have a V8 Supercar series too? And remember, we could be watching this! And check out Sittin Waitin Wishin.